The idea for our bug craft was created while finishing our Toilet Paper Roll Wall Art. Grace wanted to paint a bottle cap. I looked at the bottle cap and the other supplies around the table when my eyes landed on the cotton balls. Because I just love the way paint looks on cotton balls, it reminded me of a little body...a bug body to exact. Credit to Housing a Forest puffy pigs for the original idea of painting cotton balls. 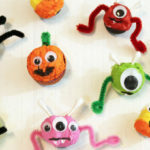 Together, the kids and I collaborated on different methods of upcycling plastic bottle caps and cotton balls.... turning them into colorful, cute bug magnets! It was genius. The kids loved it and our creativity flowed. Starting out with ladybugs, then moving to bees, wasps & eventually a fly. They were so simple to make that even Grace got involved in filming of our bug craft video, ALL BY HERSELF. 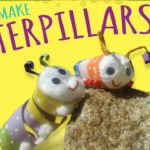 Let this little bug craft be your inspiration to create whatever insects your little buggers can think of...spiders, dragonflies, butterflies, etc. • Plastic bottle caps (optional for the bee). • Mod Podge (We tried the new kid friendly formula and were delighted with the results). • Magnets (We picked up 35 for about $2.00 at the local craft store). • Pipe Cleaners or whatever else you have around the house for antennas. 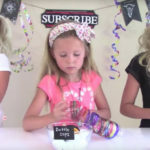 Dipping your cotton ball in Mod Podge and tucking it inside the bottle cap. The bulge above the bottle cap becomes the body of your insect. If you're making the bee you can glue the magnet right to the bottom of the cotton ball. Watch our video here for a guide. Paint the bottle cap & cotton ball. Then let that dry for about 15 minutes. 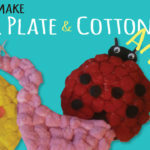 If you're creating the ladybug or wasp, cut a half circle out of black construction paper and hot glue it to the head of the cotton ball. This will become the head of your insect. Next you'll hot glue or Mod Podge your googely eyes onto the head of your bug. For those of you making the bee, just glue those right to the cotton ball. If your bug needs wings or antennas glue those on accordingly. Our video shows you how to do this step. 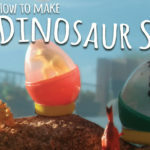 The last step is to hot glue a magnet to the bottom of your bottle cap and display on the refrigerator. Comment on our video which bug you liked best!